ST. GEORGE — A collision between a driver and a bicyclist at a busy intersection Friday left the rider with minor injuries. A few minutes before 11 a.m. emergency personnel and officers were called to an incident involving a collision between a vehicle and a bicycle at the intersection of South River Road and St. George Boulevard, St. George Police Officer Ken Childs said. Upon arrival officers found the bicycle on the sidewalk with the 20-year-old rider nearby. The driver of a white Honda passenger was waiting to speak to officers after pulling into a parking lot near the corner. The Honda driver told officers that he pulled up to the intersection adjacent to the Chevron gas station intent on making a right-hand turn to head north on Red Cliffs Drive. 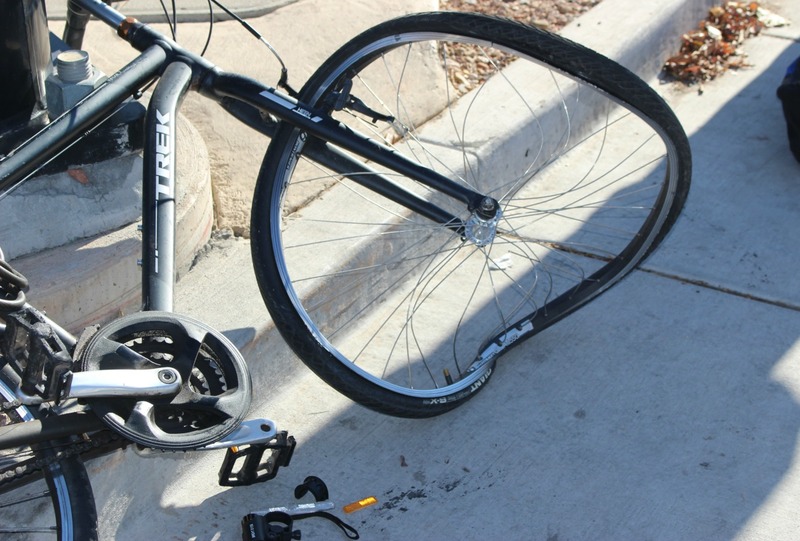 Meanwhile, the bicyclist was riding against traffic heading south on the sidewalk to the east of Red Cliffs Drive, and as he left the sidewalk, the bike struck the passenger’s side of the Honda just as the driver was pulling out into northbound traffic. According to witnesses at the scene, the rider left the sidewalk and entered the roadway without slowing down or stopping to make sure it was clear. The driver said “he looked left, looked right and then left again,” Childs said, before pulling out from the corner. The driver told Childs two large traffic signal poles may have obstructed his view, which was made worse with the bicycle “darting” out into the street from the sidewalk. The rider sustained minor injuries in the crash and was treated by EMTs at the scene. “A good point for a bicyclist is to slow down and make sure the intersection is clear before entering the roadway,” Childs said. Bicycles are considered “vehicles” under the law. Cyclists are required to obey all traffic signals, stop and yield signs. Ride as far to the right as practicable. Bring the bicycle to a complete stop at an intersection. Wait a reasonable time of not less than 90 seconds before entering the intersection. Maintain brakes so the rider can stop within 25-feet from a speed of 10 mph. The St. George Police Department, St. George Fire Department and Gold Cross Ambulance responded and tended to the scene. For a complete list of bicycle safety laws and other information go to bikeutah.com. Why wasn’t the bicyclist cited? We need to strengthen the traffic laws for cyclists. If they are to occupy streets, along with other traffic, they need to have their bikes equipped with lights to the front and rear, the drivers need to have an operator’s license, and they need to register and insure their bikes, then they will really feel like they belong with vehicles on the city streets..
Not understanding here……the bicycle was going the wrong way on the sidewalk? I didn’t know there was a right/wrong way on the sidewalk. you are right foxyheart, it does not make sense, I ride on sidewalks in busy traffic and it does not matter which direction you go, I get off sidewalk if there is a pedestrian and will do anything to stay off roads in this city. I had one close call with cell phone user, If nobody is going to enforce the law, I will stay on sidewalks. It is too dangerous to even drive a car on a street anymore. Since people are too lazy to walk, why can’t they let bicycles on the sidewalks and make use of them and get them out of traffic? I also remember having to get off a bike a walk it across the street… what happened to that? So bicycles are considered vehicles by law, they should be treated as such and the cyclist should be cited. Vehicles can’t be ridden on sidewalks legally, so bicycles shouldn’t. Vehicles are required by law to be insured, why not bikes? Vehicles on roadways have to be licensed, shouldn’t bikes? Maybe if bikes were licensed as vehicles, there would be enough money to put in real bike lanes. Maybe laws need to change to reflect the changing needs of road use by the bicycles? Of all the bicyclists to get hit. One riding on the sidewalk. I’m amazed that the ones that ride two abreast and in a herd don’t get hit. Those of us who ride regularly around town, and along the exceptional bikepaths laid out by the City of St George, tend to avoid high traffic areas such as River Road, because the bike “lane” all but disappears, and requires riding on the sidewalk to avoid becoming a victim of distracted drivers. When riding on a sidewalk, common sense dictates you give way to all pedestrians, and at a driveway most of us intent on self-preservation would stop and wait until the car exits. Most of these driveways lacks signals and crosswalks, so common sense prevails. Surprised that the cyclist was not issued a citation for failing to yield to the driver in this incident. I almost was nailed in the same situation by a bike traveling fast opposite the flow of traffic. He would have hit me had I not stopped quickly. The California Vehicle Code views bicycles not as vehicles, but devices, and cyclists as drivers. … Well, it means that you give up your rights as a pedestrian when you ride a bike in the crosswalk. When you pedal your bike across a crosswalk you do not have the right-of-way. That’s just how the law is. Not sure if Utah has the same view about this? If it’s considered a vehicle, which hits another vehicle and is at fault, how is it possible that didn’t get a citation? Also… Without one, how is the biker liable for damage to the other vehicle?? Makes no sense, really. I agree that if they choose to ride around town and on the road, they should have registration and insurance just like any other vehicle, for everyone’s protection.